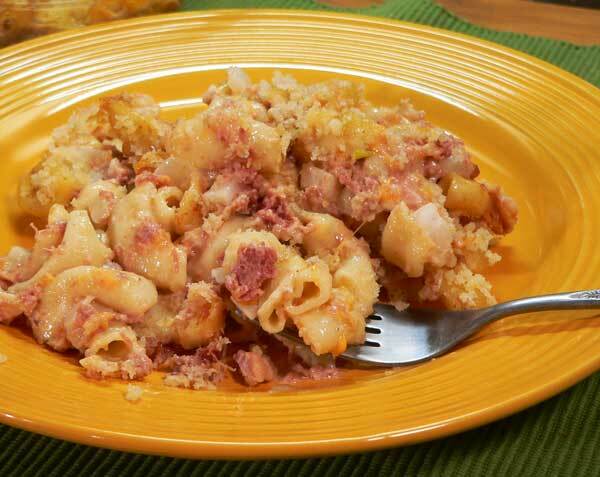 Follow our step-by-step, photo illustrated instructions to learn how to make this deliciously easy Corned Beef Casserole made with Macaroni and Cream of Chicken Soup. Printable recipe included. My mother was a Stewart before she married my dad, and the book is a collection of recipes from her sisters and other members from her side of the family. It was just a small book that was only sold during our annual family reunions for several years. 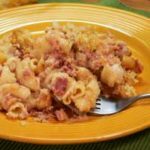 I’ve cooked numerous recipes from the book and you’ll find them here on Taste of Southern as well. Recently, I did a recipe for Corned Beef and Cabbage after a subscriber to the Newsletter had asked me about it. Then, while thumbing back through the family cookbook, I saw this recipe and decided I wanted to make it as well. 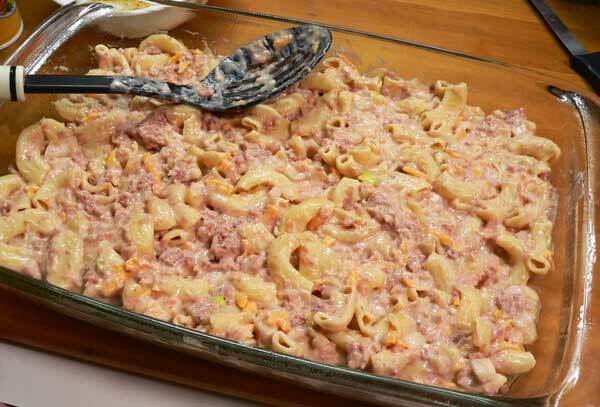 This particular recipe was submitted by my Aunt Lucille, a great cook in her own right, as all of my Mothers sisters were. Just call me prejudiced, that’s okay. Smile. I’m not saying my Aunt invented the recipe, she just submitted it to the book as a “favorite”. That’s what the entire book is, family favorites. I made this per her recipe, using elbow macaroni and cream of chicken soup. You could easily use egg noodles and even cream of mushroom soup if you prefer. I think it would be good either way. This would also be a great dish to double up on and carry to a family reunion, church social, or just to feed a big bunch of family and kids. Its one all the family can enjoy. I hope you’ll try it soon. Ready to do just that? Alright then, lets head on out to the kitchen, and… Let’s Get Cooking! 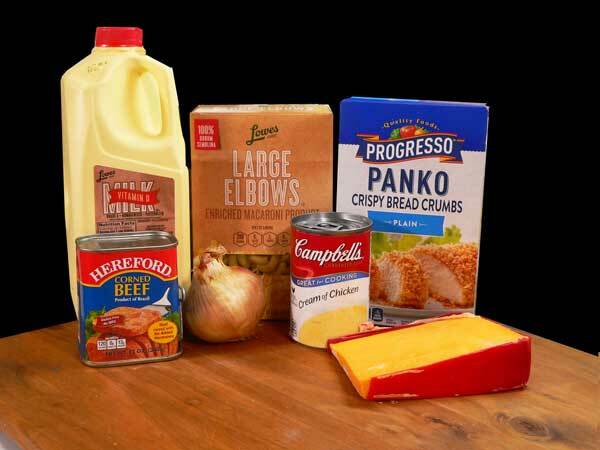 Corned Beef Casserole Recipe – You’ll need these ingredients. 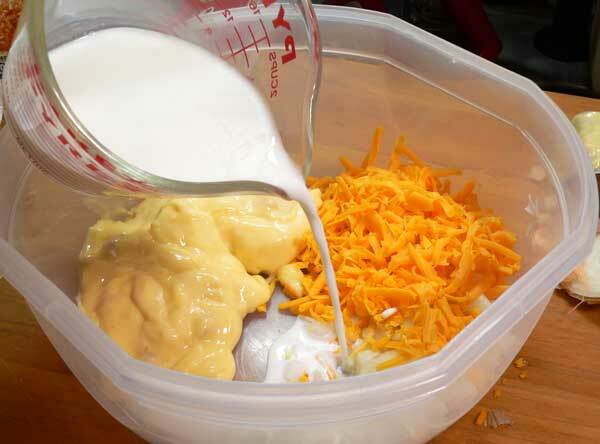 I’m using an old Southern favorite known as “hoop cheese” in this recipe, but any good cheddar cheese will work for you. And, please note that we are using Corned Beef and not Corned Beef Hash, there IS a difference. Thank you for listening. Smile. Follow the directions on your package to cook the pasta, but cook it about 3 minutes LESS than the time called for. You want it to be al dente as they say, or to still have a bit of a bite because we’ll be cooking it more once it goes in the oven to bake. Drain the pasta and set it aside while we mix the other ingredients together. The recipe calls for 8 ounces of pasta before cooking. My box was a 16 ounce sized box but I went ahead and cooked it all because I wanted to use the remainder with another recipe. I’m also using jumbo elbow macaroni. The smaller regular size will work, or you could even use egg noodles if you prefer. 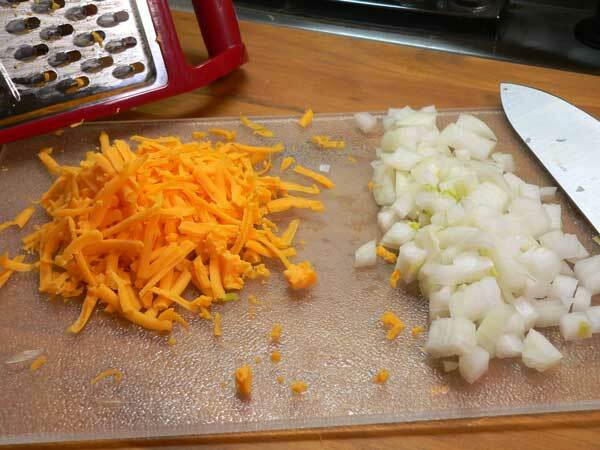 Grate the cheese and dice your onion. It’s always better to grate cheese from a slice or block. 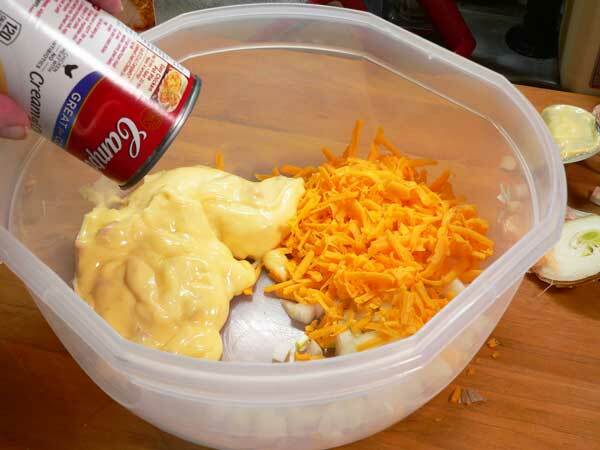 The pre-shredded cheese is much harder, and it has some type of cornstarch substance on it to keep it from sticking together. You’ll like the freshly grated type much better and it only takes a couple of extra minutes. 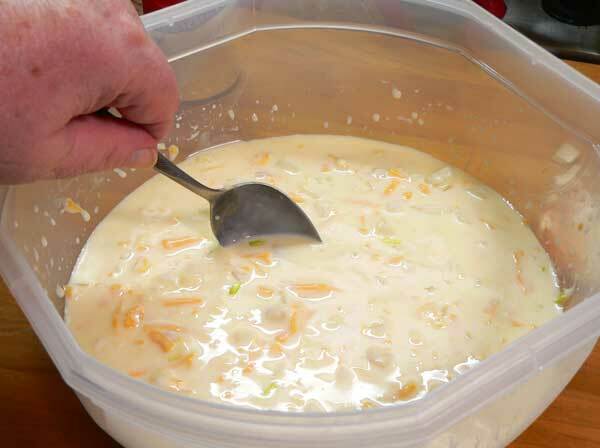 Place the grated cheese, diced onion, and the can of Cream of Chicken soup in a large mixing bowl. Use the soup straight from the can and don’t add any water to it. Grab a spoon and stir everything together until fully combined. 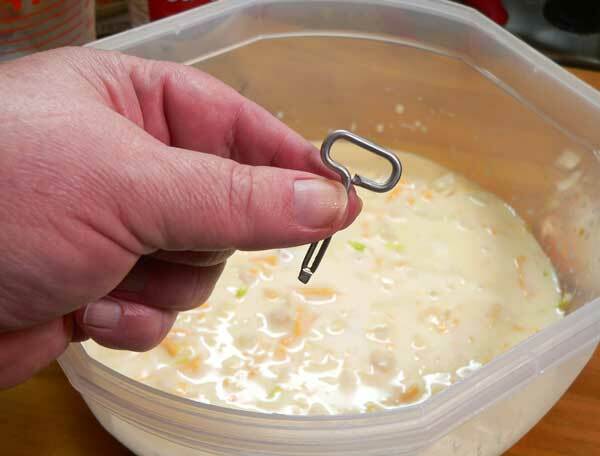 Work out any lumps of the cream of chicken soup until it’s all smooth. I mentioned this in my recipe for Corned Beef and Cabbage, but didn’t have a close up photo of it. It had been a long time since I’d seen a can with one of these keys on it that you use to open the can. They use to be very popular on cans many years ago, but they’re not used very much these days. 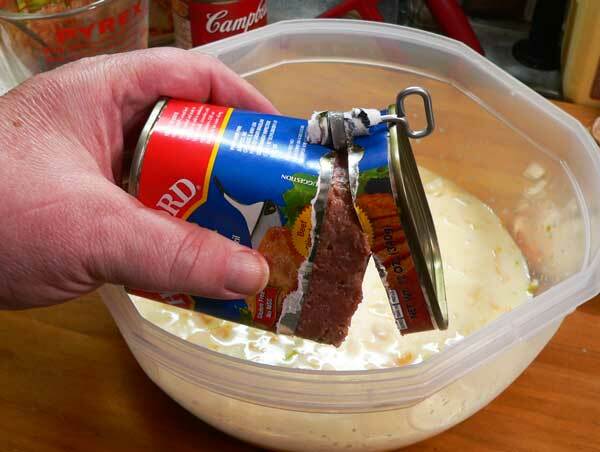 You could break the corned beef up by hand, or just use the spoon to scrape it out into the soup mixture. You don’t want large pieces of meat, so break it down into much smaller pieces. Stir everything together again, mixing the corned beef into the soup mixture. 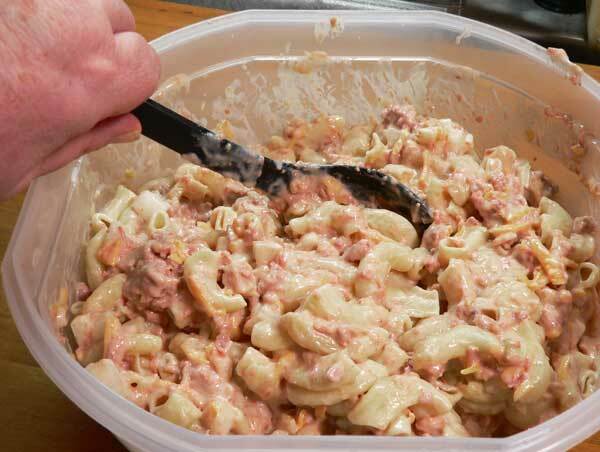 Add the macaroni to the mixture. Again, I’m using only half of the pasta that I cooked. The recipe calls for 8 ounces and I cooked a sixteen ounce box of pasta. 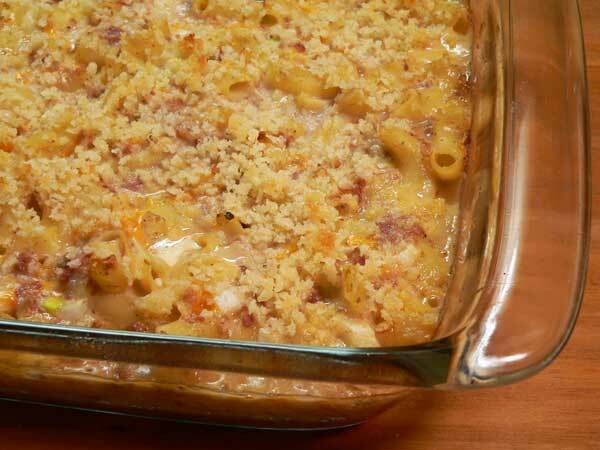 Use a large spoon and fold all the ingredients together until the macaroni is fully coated. 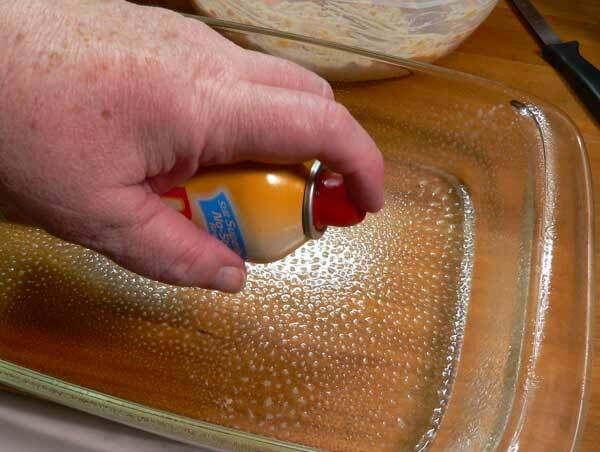 Spray or butter your baking dish. 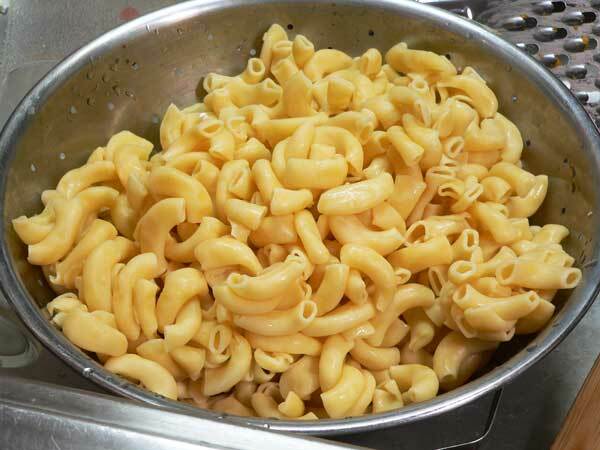 I decided to use a 13x9x2 inch casserole dish because I was using the jumbo sized elbow macaroni. 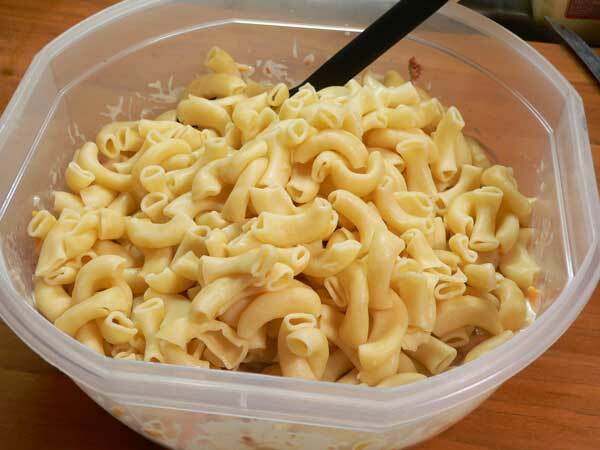 If you’re using smaller shaped pasta, you might not need a large dish like this. Spoon the pasta mixture into the dish. Spread it out evenly. Place the butter in a small bowl, and microwave it for about 10 seconds to fully melt the butter. Then, pour the bread crumbs into the butter. 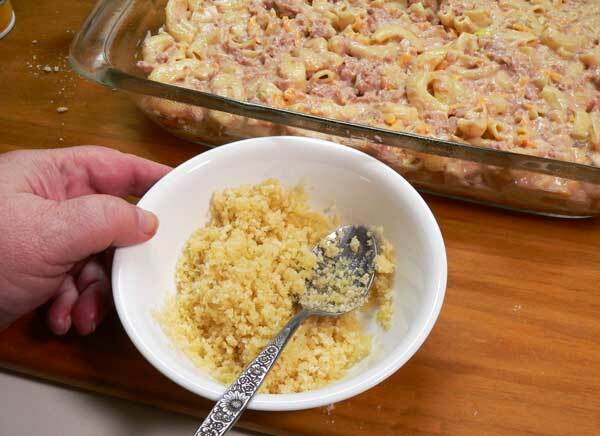 Stir the butter and breadcrumbs together to fully coat the breadcrumbs. 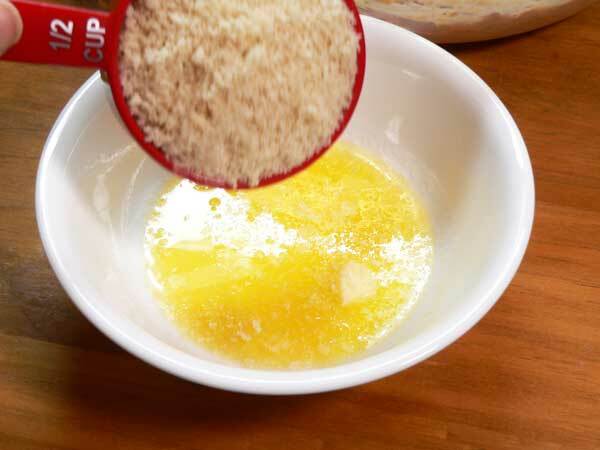 Spread the buttered breadcrumbs over the top of the mixture. Place the casserole in the oven and let it bake for 25 to 30 minutes, or until it’s bubbling hot and slightly browned on top. When it’s done, remove the dish from the oven and place on a folded towel to cool for about 10 to 15 minutes. 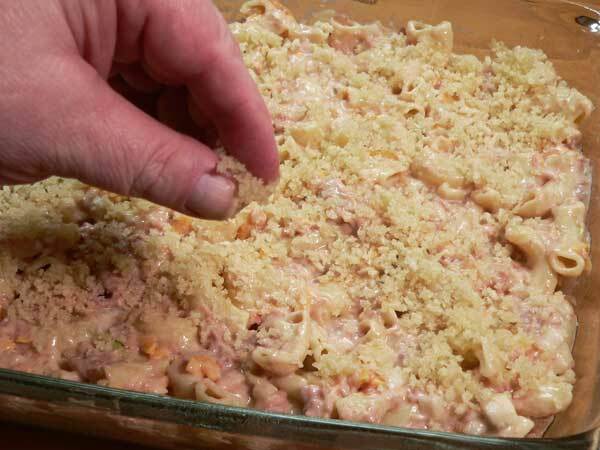 Serve the casserole while it’s still warm and dig in. Have you tried our Corned Beef Casserole? Do you have special memories of this dish? I’d love to hear from you. Just 2 days ago my husband was talking about a dish his Mom used to make, this sounds just like it. They lived in RI at the time. I will surprise him with it soon! Thanks!! I so look forward to starting the week with your Monday emails. The stories about your Mama and memories of growing up make my day. It would be such a blessing to have a Stewart Family cookbook if at all possible. Thank you Steve. Cook 2 cups noodles in unsalted water and drain. 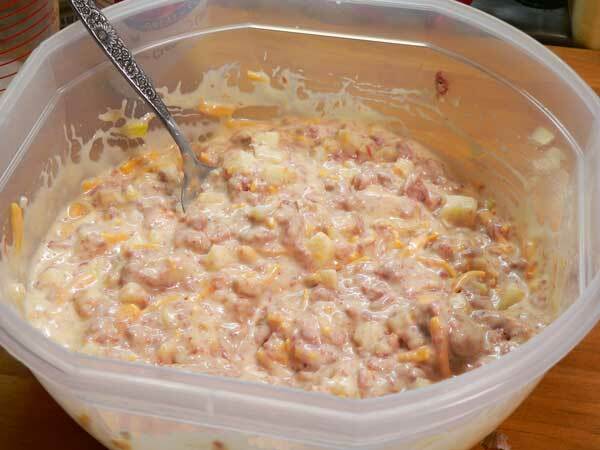 Mix with soup, beef, milk, 1 c. cheese and onions. Pour into 1 1/2 qt. buttered baking dish and top with potato chips 3/4 c. cheese. Bake 375 for 30 min. Sounds good. I’m going to try that recipe. I’ve never seen any recipes for corned beef casserole before. 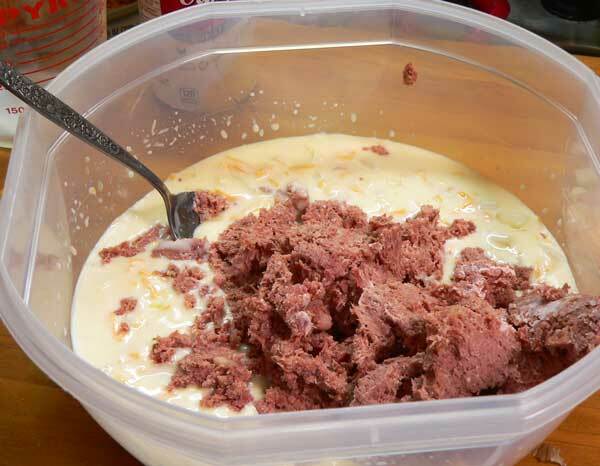 One thing we have always liked using canned corned beef is breaking it up and heating in a pan and adding bbq sauce. Serve on hamburger buns. Thanks for sharing your family recipes. I’ve got to make this for my husband, he would love this. Thanks for the recipe.